Synopsis (Goodreads): Weary of her storybook, one “without pictures or conversations,” the young and imaginative Alice follows a hasty hare underground–to come face-to-face with some of the strangest adventures and most fantastic characters in all of literature. These books were so adorable to read! I never read these books when I was younger, but it didn’t change the feel I had while reading them. They are just as nice to read as an adult as when you’re in elementary school. Such a classic children’s book. Both books where very fast-paced, which made the reading very fun and easy. Children won’t lose interest very fast when reading this. The additional illustrations where very lovely and give a sweet look to the story. 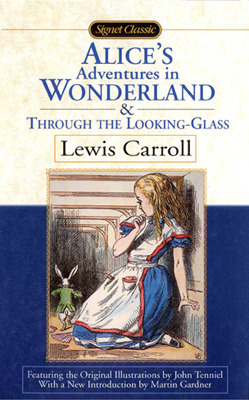 I enjoyed Alice in Wonderland a bit more than Through the looking glass. I think because I have a better image with Alice in Wonderland, having seen the movies and being a story that is told more. Sometimes I thought that Alice sounded a little mean and spoiled. This made the conversations with characters as the Mad Hatter and the Cheshire Cat very fun and playful. I read that some people thought the ending was too abrupt. I agree a bit with that, but it’s also what feels like a fairytale to me. I just had a lot of fun reading it. I gave this book 4/5 stars. Let me know what you think in the comments.